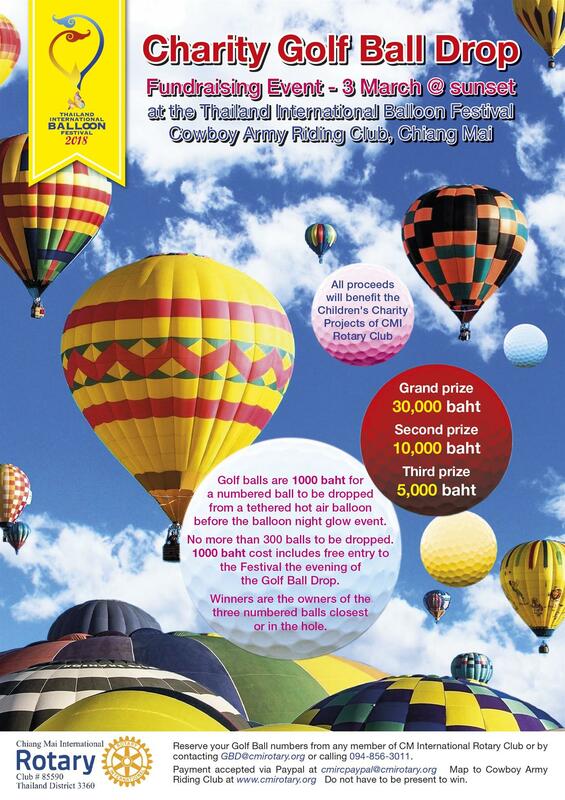 On 3rd of March, CMIRC will be having our Charity Golf Ball Drop Fundraiser in association with the Thailand International Balloon Festival. This is a major fundraiser for our club and funds raised go exclusively to support our many local projects associated with children’s health, safety and education. All club members are encouraged to sell tickets and friends of Rotary can contact the club to purchase their golf ball -- paying via cash, bank transfer to Rotary’s account or Paypal payment to cmircpaypal@cmirotary.org Overseas support is welcome; the winner does not have to be present to win. Three cash prizes will be awarded for the three numbered balls landing closest to the hole – 30,000 baht ($US940), 10,000 baht ($US310) and 5,000 baht ($US155). Tickets are 1000 baht each and no more than 300 will be sold. With three prizes, this means the odds of winning are at least 1 in 100.